Bloomington, Ind. 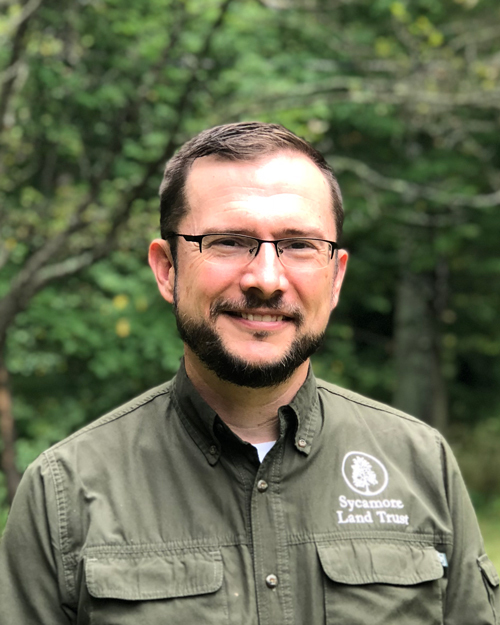 – John Lawrence has been hired as the Executive Director for Sycamore Land Trust, which protects land and connects people to nature in southern Indiana through strategic conservation and environmental education. Having served as the organization’s Interim Executive Director since September 1, 2018, Lawrence is well prepared for this role. He has worked at Sycamore Land Trust for more than 13 years, the past 10 of which as its Assistant Director. A lifelong resident of Monroe County, Lawrence earned a Bachelor of Science in Public Affairs with a major in environmental management from Indiana University’s School of Public and Environmental Affairs. In addition to his experience with Sycamore, he has served as president of the Sassafras Audubon Society and volunteered with Wildcare, a local wildlife rehabilitation nonprofit. Former Executive Director Christian Freitag left Sycamore Land Trust after 18 years to direct the Conservation Law Center in Bloomington, which provides legal services to environmental organizations including Sycamore Land Trust. As Executive Director, Lawrence provides the vision and oversight for key program areas including land protection, land stewardship, and environmental education while overseeing six other full-time professional staff and several student interns from Indiana University. His chief responsibilities include maintaining Sycamore’s strong financial health, negotiating land donations and purchases, conservation planning, working with the organization’s board of directors and advisory board, establishing partnerships and collaborations with other conservation groups, and guiding the nonprofit with the distinctive mission of protecting and restoring habitat forever. Sycamore’s board of directors, chaired by George Huntington, conducted a thorough national search and interview process. Board member John Whikehart, former chancellor of Ivy Tech Community College-Bloomington, led the search committee. Since Lawrence joined the staff in 2005, Sycamore’s acreage of protected land has nearly tripled, to over 9,700 acres today; the staff grew to seven full-time employees; Sycamore completed the challenging process of applying for accreditation through the Land Trust Alliance; and the Environmental Education program expanded both in scope and in a now almost fully funded endowment. Through strategic acquisitions in the Beanblossom Creek Bicentennial Conservation Area, Sycamore expanded its footprint protecting this important watershed to more than 1,500 acres. 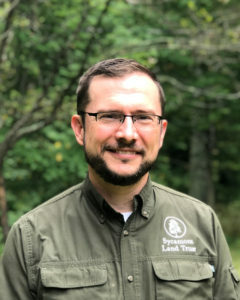 With Lawrence officially appointed as the new director, the staff and board of Sycamore Land Trust are eager to continue and expand upon the organization’s work to protect southern Indiana’s important natural places, restore native habitat, establish a conservation ethic among all Hoosiers, and create a healthier environment for future generations.